The main purpose of the tailrotor (or anti-torque rotor) is to prevent the helicopter from spinning, due to the engine's generated torque (in order to drive the main rotor system), and the reaction torque (Newton's Third Law) working on the fuselage. The tailrotor rotates much faster than the main rotor, and is powered by the same engine that powers the main rotors. 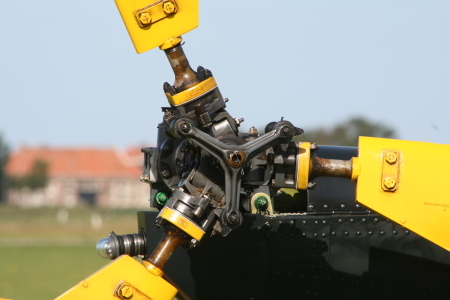 In order to realise collective blade pitch control of the tailrotor blades, the tail rotorhead uses a swash-plate construction in a similar way to the main rotorhead. The tailrotor blades are manipulated by the pilot's foot pedals, resulting in yaw control. There is no need for cyclic control with the tailrotor. The tailboom has several functions. First of all, it provides the arm to the tailrotor generated anti-torque force. The tailrotor itself is housed at the end of the tailboom for this reason. Furthermore, the tailboom contributes to the aerodynamics of the helicopter, and the horizontal and vertical stabilizers are, consequently, attached to it. With increased airspeed, they provide stability due to their weather vaning effect. In some designs, the tailboom also plays a role by providing (some) anti-torque lift, which is produced by the main rotor downwash passing the tailboom. The tailboom is thus deliberately shaped in order to generate this anti-torque force. Of course, the tailboom also supports and shields the shaft (or belts) that are used to drive the tailrotor from the main transmission.